I was supposed to be turkey hunting but thanks to a quick 30 minute hunt on opening day whereby I basically had a big Tom turkey land in my lap within a few minutes after leaving my truck…I was now pulling out of my driveway at just a bit before 6am to meet Frank in Linton. We would be fishing a new piece of water…one that I fished as a kid, maybe you did as well? Thousand Islands recreation area had just opened and fly fishing new water, well…it is truly one of my favorite things to do in life! I headed south and west from Spencer, took a right on 54 and in a few minutes pulled into the Linton McDonald’s where Frank Terkhorn and I would not only talk about today’s fishing, but the past week and Frank’s upcoming adventure to Decorah, Iowa where he would be spending a few days fishing for various species of trout. Frank followed along as we took a left on Indiana highway 59 and moved slowly south about a mile and a half. A right (west) on county road 25S and in less than a mile I could see the yellow signs identifying the land to the south of the road as state lands. We pulled into the first open gravel drive and took a minute to look at the clarity of the water at this small pond; it was cloudy for sure but I told Frank that, “We were here and we might as well give it a go”! I shoved off on one side and Frank the other, due to him being messed up (left handed). I had my 6 weight rod with a type one sink tip line and a large (5 inch) white streamer that showed up well in the cloudy, murky water. 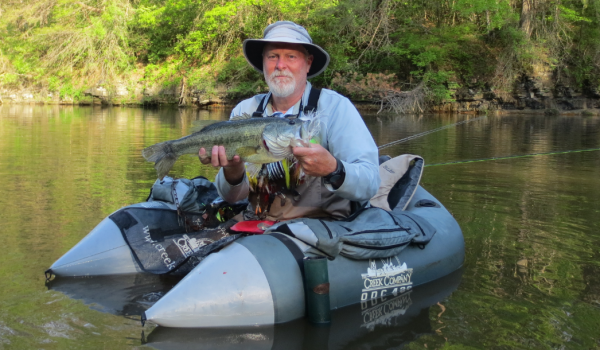 The beauty of fly fishing from a float tube is that you can move as quietly and smoothly as possible. Not only are you very efficient but by moving backwards, you are able to continually cast, fish and make adjustments to depth and location of the casts…truth is if you ever get to fish from a Creek Company ODC 420 float tube…it will ruin what your perception of intimate fishing is all about. I had gone about a hundred yards without even a tap. The water looked very fishy and the surrounding hillside and structure was simply stunning. The sun was just beginning to sneak up from behind the tall stand of pines to the east and it was at that moment that I heard a thunderous gobble from just above our vehicles. A few seconds later and another blast from ole’ Mr. Tom. I listened closely and minutes later I could hear the ‘whoosh’ of wings and knew the bird had indeed wafted down into the same parking area that we had just vacated. Sure enough, moments later and the bird cut loose with a double-gobble. I was still casting and fishing…and listening…and wishing I had my box call…when I felt a big pop on the other end of my line. Without thinking I strip set with my left hand and felt my Rio line come taunt and knew that I was hooked up with a big fish. My counterpart made one big run and then it happened, he came un-buttoned. Total exhilaration had quickly turned to a second of…”Did that just happen”? Without thinking I back-casted and placed the fly right back into the same piece of water and just let the white fly sink. One thousand one, one thousand two, one thousand three, one thousand…and bang, my fish had returned, looking for his meal that he had just had in his mouth a few seconds earlier. This time I strip set with enough force to clearly set the hook deep into its jaw. I raised my rod and the battle was on. You know it is a good fish when a 6 weight rod is completely doubled over and the rod tip is in the water. I stripped hard, still not knowing what I had…when up from the murky water came a big bass. Behind me and to my right I could hear Frank ask, “Is it a big one”? My answer was short and sweet, “Yes”! This is where I knew that I just needed to be patient and allow the fish to tire a bit before trying to do anything heroic. What was probably only a couple minutes felt like a long time but in a triumphant grab I reached into the stained water and lipped a largemouth bass that was 22 inches long and weighed in at 6 pounds. It was a big male; I knew so because it had a large and pronounced kipe on his lower jaw. I held the fish up and spun my tube around so that Frank could see, “Wow, that’s a great fish”, Frank hollered. I had all but forgotten about the turkey, but as I was kicking backwards the few yards over to where Frank, now my photographer (see above photo) was, Mr. Tom apparently was less than impressed with my catch…he was busy ‘looking for love’ and once again let out with a gobble. 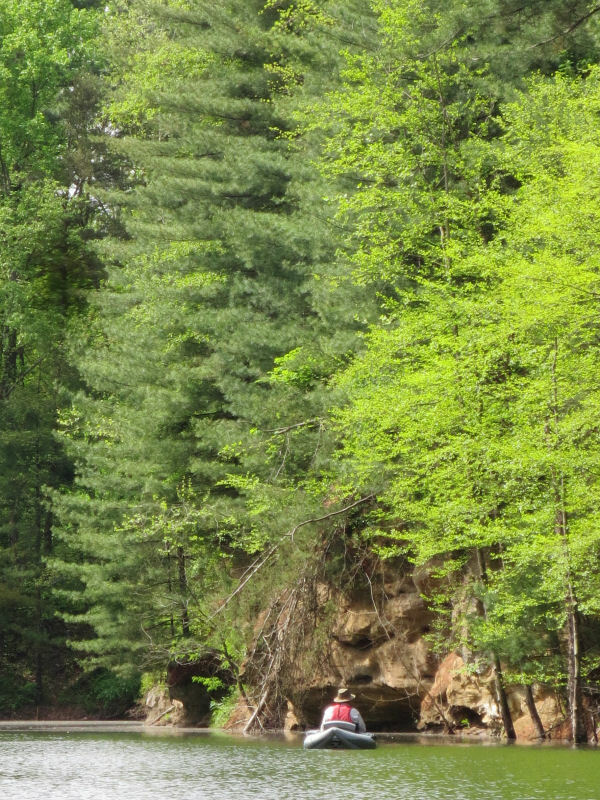 Frank and I took a moment to talk about how utterly beautiful both this area was and how lucky we were to be able to fly fish some of the best water Indiana has. Thousand Islands has a total of 869 acres, a good part of which is water. It is now governed by The Goose Pond FWA and information can be found by calling Travis Stoelting at 812-659-9901. 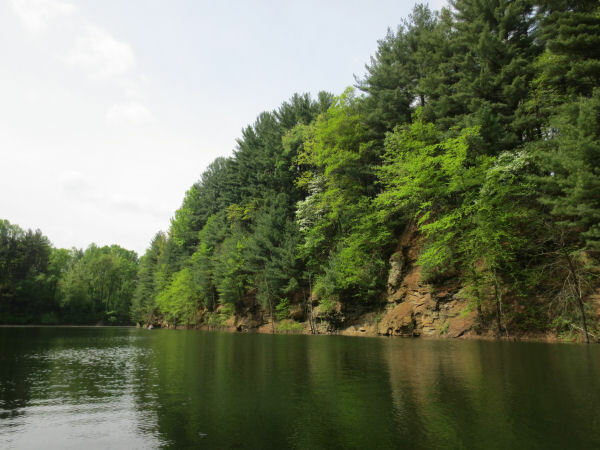 If you are looking for a spot to fish, hunt, pick a mushroom or just take a hike…then give this newly purchased area a look and I know you will Enjoy the Great Outdoors.